Dietrich, driver of the Gary Kauffman Racing/Weikert’s Livestock/Sandoe’s Fruit Market/Pace Performance/Gsell’s Whitetails/Hickory Run Orchards/Drop Of Ink Tattoo/Sweeney Cars/Self Made/No. 48 sprint car, finished third and fifth during his evening at The Grove; third during the evening’s regular program and fifth during the Al Hamilton Tribute main event which was made-up after being cancelled earlier in the year due to weather. 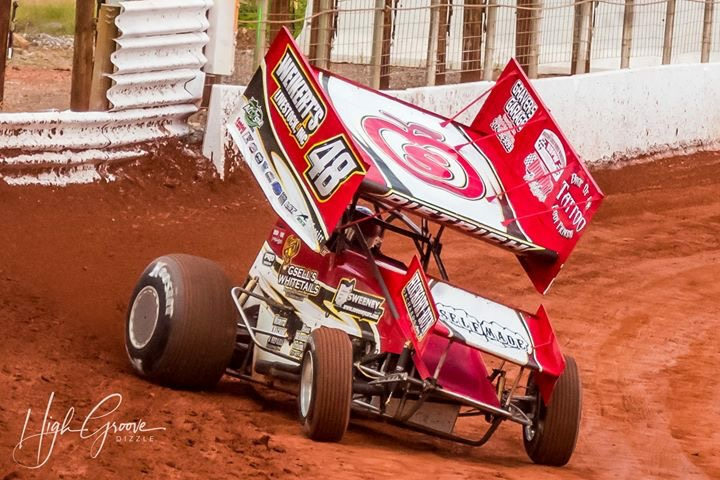 Impressive enough, Dietrich started eighth and 11th, respectively, during the Williams Grove Speedway main events, advancing a grand total of 11 positions in two features. Adding to his consistent effort, ‘Double-D’ entered the $27,000-to-win Dirt Classic 5 at the ‘Fabulous’ Lincoln Speedway on October 6 and finished fourth, bettering one position after starting fifth on the grid. 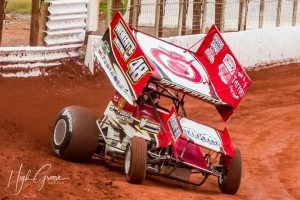 Danny Dietrich and Gary Kauffman Racing hope to make four starts in three days during the upcoming weekend, kicking things off with an unusual Friday night visit to the Port Royal Speedway ‘Speed Palace’ on Friday, October 12. Action will continue on Saturday, October 13, with a Central PA doubleheader; Lincoln Speedway in the afternoon followed by a start at BAPS Motor Speedway later that evening. 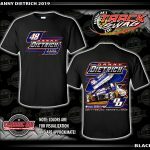 If the agenda continues according to plan, Dietrich will make his fourth and final start of the weekend on Sunday, October 14, during the World Series of Dirt Track Racing at Selinsgrove Speedway. 2018 Highlights: Earned three top-ten finishes against the Arctic Cat All Star Circuit of Champions presented by Mobil 1 during trip to Florida in early February, all highlighted with a seventh place finish at Volusia (Fla.) Speedway Park. Earned win at Lincoln Speedway on 3/10 worth $3,500. Finished second at Lincoln Speedway during Sprint Spring Championship ($5,000). Earned pair of seventh place finishes at Williams Grove Speedway and Port Royal Speedway on April 6-7. Picked up second win of 2018 at BAPS Motor Speedway on Sunday, April 8. Finished third with All Star Circuit of Champions at Williams Grove Speedway on Friday, April 13. Finished eighth at Williams Grove Speedway on Friday, April 20. Earned third victory of season on Saturday, April 21, at Lincoln Speedway. Rallied from 12th to finish sixth during Sprint Car World Championship at Mansfield Motor Speedway on Saturday, April 28. Finished fifth during World Championship preliminary feature on Friday, April 27. Earned runner-up performance at Williams Grove Speedway on May 4. Earned fourth win of season on Saturday, May 5, at Port Royal Speedway. Finished second during WoO Tuneup at Williams Grove Speedway on May 11. Finished sixth during Bob Weikert Memorial finale ($10,000-to-win) at Port Royal Speedway. Earned first Williams Grove Speedway victory of the season on Friday, June 1. Earned four consecutive top-ten finishes from June 7-10, three of which during All Star Circuit of Champions competition in New York. Highlighted Ohio Sprint Speedweek with three top-ten finishes, one being a third place finish at Sharon Speedway on June 19. Earned three victories during PA Sprint Speedweek; two at Lincoln Speedway and one at Port Royal Speedway. Earned a combined seven top-ten finishes during PA Sprint Speedweek. Earned ninth victory of season from 11th during Lincoln Speedway make-up feature on Saturday, July 14. Finished second during Port Royal Speedway’s Living Legends Dream Race ($10,000) on Saturday, July 28. Finished third during Mansfield’s Great Lakes Dirt Nationals on August 11. Finished sixth at Lincoln Speedway during non-stop 25-lap feature on August 18. Finished sixth against All Stars at Grandview Speedway during Thunder Cup on August 23. Hard charged from 21st to finish ninth against All Stars at BAPS Motor Speedway on August 26. Finished third during Juniata County Fair opener at Port Royal Speedway. Charged from 14th to 4th during Labor Day Classic at Port Royal Speedway. Finished ninth against All Stars during Selinsgrove Speedway’s National Open. Charged from 14th to sixth during Lernerville’s Commonwealth Clash (WoO) on September 22. Declared winner at BAPS Motor Speedway on Thursday, September 20. Scored top-five finishes at Williams Grove Speedway on October 5; third during regular show, fifth during Al Hamilton Tribute. Finished fourth during Lincoln Speedway’s Dirt Classic 5 on October 6.